The more I shift my lifestyle to being more natural and green, the more I learn and discover! This is especially true for finding new brands that are safer and cleaner in formula, but which aren't necessarily marketed as such. Brands like these don't make it their sole aim to wave and shout about their formulas or ethics etc, they simply display themselves and beautiful products and just casually throw in there that they are actually very great 'clean'/'green' etc brands/companies/products! At the same time I'm also finding new brands that do shout it out there for everyone to see! They do boldly state their great formulas and credentials but without all the flowery, green and dare I say it, 'hippy' vibes that often adhere to natural products and companies. Lately, Ive been coming across lots of beautiful nail polish brands that I've discovered, after a bit of noseying around, are great 5-free or 3-free formulas. These brands are a mix of well known 'green' brands and some that I had no idea where anything 'free' at all until I really checked them out! This is a brand that I first heard about through the lovely Ria from Naturia Beauty. Ria has nails that put me to shame and ever since I've seen her review of these polishes, I've been dying to try them. They look so quality and glossy, also I'm a sucker for great packaging, details has gone into every aspect and the modern and slick exterior doesn't scream natural at all! O.F.A.T polishes are created with a 5 free formula and the brand is part of Positive Luxury so they tick all the right boxes for me! Priced at £16 each these are a little pricey and are more what I would call a premium/high end splurge/ treat product! A much more obvious choice of brands here, you don't get far into exploring the natural, green beauty offerings without coming across Kure Bazaar and great reviews about them. Saying that I've never tried one of their polishes. Kure Bazaar is a french brand that really tout their natural ethos. They are 5 free and 85% natural and focus on not only being 'toxic free' but also healthy for your natural nails. Again these are a little on the steeper price side at £15 each. A very recent discovery for me! I heard about the brand and saw it pop up a few places but never recognised it as a 'toxic free' brand until I very quickly realised it after researching the brand for my job. Now I laugh at myself because despite how chic and modern the packaging looks, pretty much everything points to them being 'clean' formulas! For starters the full name is Soigné Botanique and second the French word Soigné translates to 'to take care of' in English, it couldn't get clearer than that! Like Kure Bazaar, these polishes are 85% natural and have a 5 free formula! Soigné polishes are a little less pricey at £11 each. Which of these brands has caught your eye the most? Love the round-up! I've been going without nail polish for ages now, but it's nice to see even polishes cleaning up their act! Will definitely check out the ones you've highlighted. I've been lusting after the Smith & Cult FOREVER so exciting to see it's now in the UK. Soigne I'd like to get a closer look at. 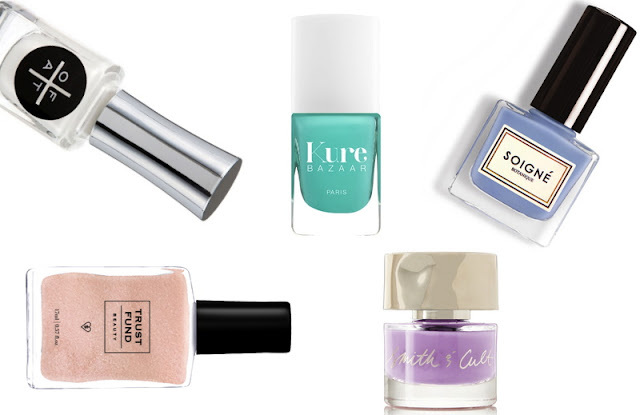 I wonder if there are any budget-friendly 5-free polishes?